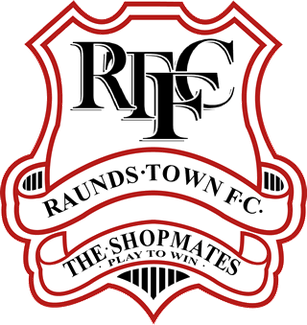 The original incarnation of Raunds Town were founded in 1896, initially joining the Northamptonshire League. They left the league in 1921, rejoined it at the start of the 1927/28 season but left at the end of the season. At some point, this original club folded, with the current incarnation forming after World War 2 in 1946. The club joined Division 2 of the United Counties League in 1950, moving into the Premier Division in 1956 before returning to Division 2 in 1961 after finishing in the bottom two for all but one of their seasons in the Premier Division. They then remained in Division 2 until 1972, moving up to Division 1, where they remained until relegation in 1979, only to make an immediate return to Division 1 after Division 2 was disbanded in 1980. The club went on to win the Division 1 title in 1983 to earn promotion to the Premier Division and, after a decade of slowly climbing up the table and consolidating themselves, the club won the title in the 1995/96 season to earn promotion to the Southern League Midland Division, where they remained for two seasons before being transferred to the Southern Division, which was renamed the Eastern Division the following season. In that season (1999/2000), the club finished second from bottom and were relegated back to the Premier Division of the United Counties League. Their first couple of seasons back in the UCL saw the club challenge near the top of the league, but the club soon entered a period of decline, finishing third from bottom in 2003/04 and 2004/05, before finishing second from bottom in 2009/10 and 2010/11. The latter of those saw the club relegated to Division 1, where they have remained ever since, recording a highest finish of 4th in the 2017/18 season. In the FA Cup, the club are notable as the only UCL club to ever knock a Conference/National League club out of the competition, beating Northwich Victoria in the 2nd Qualifying Round in the 1992/93 season. 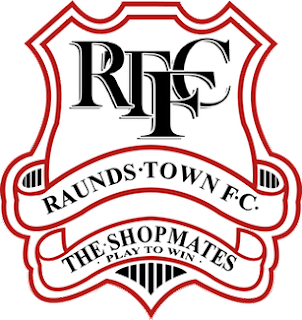 However, the club's best run in the competition came in the 1998/99 season when the club reached the 4th Qualifying Round, beating Desborough Town, Nantwich Town and Rothwell Town before losing to Enfield. In the FA Trophy, the club's best run saw them reach the 3rd Round in the 1998/99 season, beating Racing Club Warwick in the 2nd Round before losing to Weston-super-Mare in the 3rd Round. As for the FA Vase, the club reached the semi-finals in the 1994/95 season, beating Stewarts & Lloyds Corby, Great Wakering Rovers, Lowestoft Town, West Midlands Police, St. Andrews and Basildon United before losing to Arlesey Town over two legs. I almost ended up visiting Raunds at the end of 2017, only for their game to end up being postponed, with me ending up at nearby Irchester United on that occasion instead. 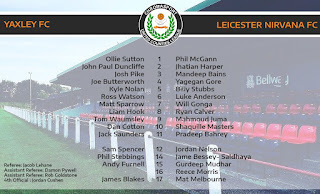 While that was a little annoying at the time, it ended up working out in my favour when the UCL announced the venue for the 2017/18 UCL Knockout Cup Final: with my team Yaxley having reached the final for the second season running, I wasn't going to miss it, so it being a new ground made things all the better. Naturally, with Yaxley's involvement in the final, it took no effort to convince my dad to take me to the game, but the effort came in planning around University: I had just finished Easter break two weeks prior and train tickets back to Peterborough for the Bank Holiday weekend weren't exactly cheap (hence me being unable to go further afield for the previous groundhop), but it was a worthwhile sacrifice to see Yaxley in cup final action again. 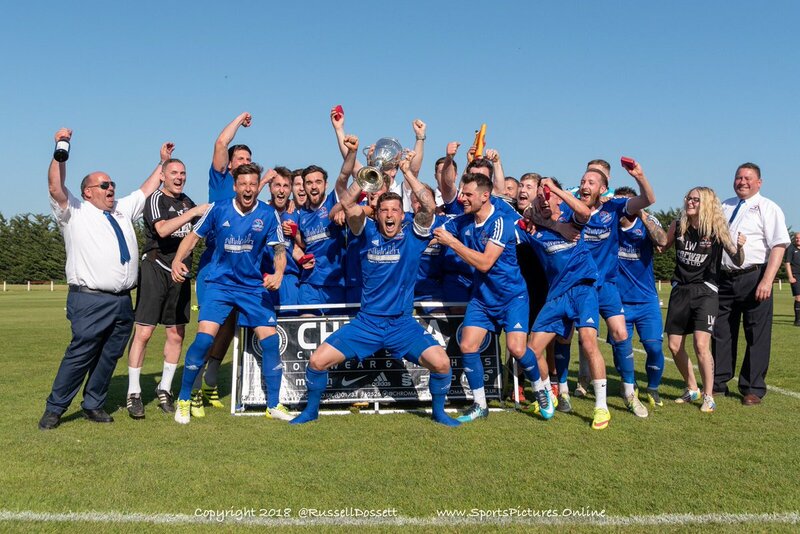 The decision became even more worthwhile when, on the Saturday of the Bank Holiday weekend, Wisbech could only draw with Daventry to hand us the title, with it being inevitable that the title celebrations would take place after the cup final, whatever its outcome ended up being. When the Bank Holiday Monday finally arrived, my dad picked me up at around 1pm and, after getting caught in some traffic here and there along the way, we arrived at the ground around an hour before kick-off, each paying £6 for admission and me paying £1 for the programme. 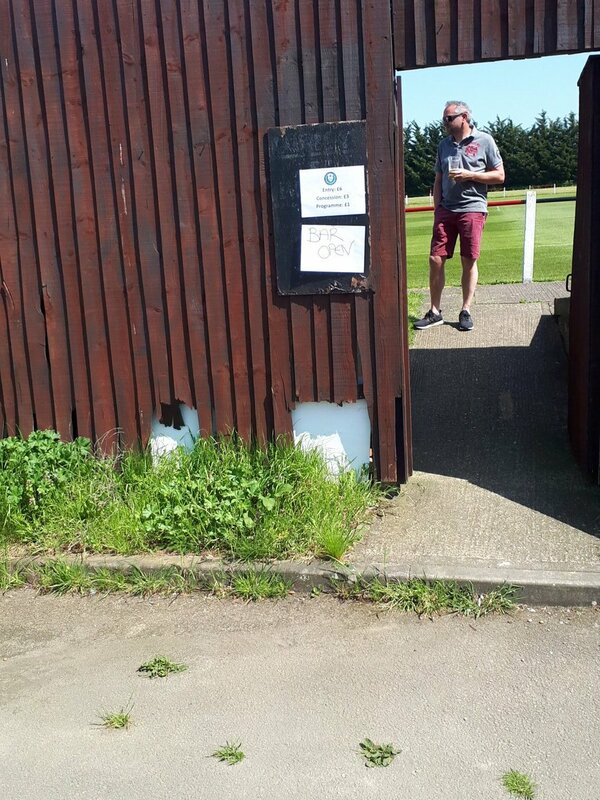 With it being an extremely hot and sunny day, we elected to sit in the stand as we awaited kick-off, talking to some other Yaxley fans to pass the time. About half an hour before kick-off, I braved the sun to do my usual circuit of photos before returning to the main stand again. After getting some photos of the teams coming out and doing the usual handshake routine (most of which weren't very good and were as such deleted), we moved to behind the far goal where Yaxley were shooting towards in the first half, then moving to behind the near goal for the second half. Having beaten Leicester Nirvana 5-1 at home just ten days before the cup final, I thought that this game would likely end with a similar outcome, but I did have some nagging doubt in my mind based on the game being a cup final and based on the very distinct possibility of the players celebrating like crazy over the weekend and not being fully at the races as a result. Ultimately, this was a disappointing end to an otherwise excellent season for us, as we were defeated by Leicester Nirvana without much of a fight back at all. Nirvana took the lead after 5 minutes, some sloppy defending setting Will Gonga through to lob into the net over Ollie Sutton in the Yaxley goal. Being so early on, I expected a Yaxley fight back, but that never really materialised, as Nirvana harried and closed us down and didn't give us the room to play that we like to have. At times, we could barely get out of our own half due to the pressure and even when we did, we simply did not take the chances that came our way. At the end of the day, Nirvana were definitely deserved victors as we simply did not turn up, though whether that was down to Nirvana's tactics or because we partied too much after Saturday's title victory, I cannot say for sure. It was disappointing to not retain the Cup this season, but the presentation of the league title and the celebrations that followed meant that the disappointment was swiftly forgotten. Fair play to Nirvana for giving us a guard of honour as we collected our medals and trophies, as I'm sure they just wanted to celebrate their own victory with their fans instead. After the game, I had a very long wait until my train left the station to head back to London, so we stopped off at KFC while I perused Twitter to see how some of the play-off finals were progressing. Overall, despite the result, this was still an enjoyable day out, with the title celebrations more than making up for the uninspiring football and disappointing result. Fortunately, we were able to complete the double later on, winning the Hinchingbrooke Cup Final on the 21st of May at St. Neots (I wanted to come back again for that, but it wasn't really financially viable and, though I was finished with lectures and seminars for the year, I was staying at University for that extra week to get most of my coursework done). Now, rather than make an entirely new post about it, I'm going to segue slightly to talk about my thoughts on what the future holds for Yaxley, both as the club's programme editor and as a fan. First off, I'm massively excited at the new challenge ahead for the club as we move up to Step 4 for the first time in our history. However, I would have been much less excited had we been kept in the Northern Premier League Division 1 East, as per the original league allocations the FA released: not only would this have increased our travelling to an absurd degree (even with several decent local rivalries such as Peterborough Sports, Stamford, Wisbech Town and to a lesser extent Spalding United), but I would not have had any chance whatsoever of getting to any of the games from University. Granted, there were some that would be feasible on the train when I was at home from time-to-time, but only if booked far enough in advance (which, in many cases, would simply not be viable due to the inconsistent weather in this country). I also worry about what impact this would have had on the club's finances, as it would be stretching us way beyond anything we were used to (400+ mile round trip to Morpeth would not be good financially, for obvious reasons). Thankfully, after another club had to refuse promotion due to unfortunate circumstances, the FA reshuffled the leagues somewhat and we ended up in the Southern League Division 1 East. While we did lose out on games against Wisbech, Stamford and Spalding as a result of this move (Peterborough Sports were transferred with us, as keeping us apart when there's just 10 minutes between the two grounds would be idiotic), we also lost those absurdly long trips into County Durham, instead ending up in a league with much less travelling. And for those lost local games, we instead gain Cambridge City (currently playing at Histon, so easily doable via the guided bus route), Bedford Town and Corby Town, along with former UCL opponents Kempston Rovers. Furthermore, this move means that we are now in a league with several grounds I could comfortably do from University, and some which are technically possible but not particularly easy. For example, Didcot Town would be extremely easy for me to get to from Guildford, as would Aylesbury United due to their groundshare at Chesham United. I believe Berkhamsted on the other side of London from Guildford would also be viable, but I would have to look into that (and Aylesbury as well. Also, there are several other Oxfordshire sides that are well within the realm of possibility (namely Kidlington, Thame United and North Leigh), but I'm not sure how feasible any of those are via public transport. At the very least, I know that North Leigh is next to impossible on public transport, so if I were to do that a lift would be needed from and to whatever station is the closest one. When I'm home from University, one that I'm hoping falls at a convenient date is Bromsgrove Sporting as, while it's not exactly cheap, it is most definitely viable on the train, and it's a ground I'm very much eager to visit, so hopefully that opportunity comes to pass next season. 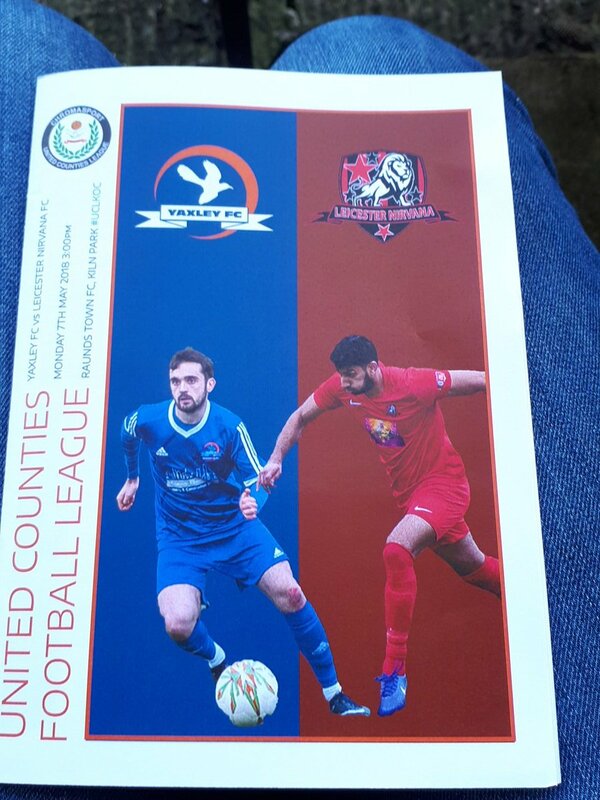 Also, ignoring my selfish excitement at likely being able to watch Yaxley more often next season, this new league is also very interesting for me as the programme editor as, based on what I can recall, the only club I've covered before is Peterborough Sports, so there will be plenty of new and interesting content to write about. One thing I will miss next season is being in the FA Vase, as the FA Trophy is nowhere near as exciting given that there is virtually no chance of a club such as Yaxley making decent progress, let alone coming close to Wembley. Then again, that'll also be a new experience, so I may as well see how it works out for us before being overly critical. So, on the whole, I'm extremely excited, and very much looking forward to the start of the league season on the 11th of August. Until then, I'm just waiting for the fixtures to come out so I can begin early planning on several groundhops for next season. Kiln Park is an excellent ground at Step 6, with it being plain to see that the ground has been at a higher level before. All the cover is one one side of the ground, with a 250-seater main stand and an area of covered standing next to it that provides cover for around 200 people. The ground has an overall capacity of 3,000, with the rest of the ground being open hard standing, with that being quite a way from the actual edges of the pitch. While it's not entirely clear why this is, it is at least understandable on the dugout side of the ground, given that the dugouts are perhaps the largest I've ever seen at a football ground. Overall, the ground is more than good enough for Step 5 and almost certainly sufficient for Step 4, should the club find themselves progressing up the pyramid in the future.